New-look Carrick Rangers welcome Premiership champions Crusaders to the Belfast Loughshore Hotel Arena this evening (Wednesday) - and if Saturday is anything to go by, it’s going to be tough. The Gers, who survived relegation by the skin of their teeth on the most dramatic of final days last term and then had an agonising end-of-season wait over an elegibility row concerning ex-boss Gary Haveron, aren’t expected to replicate the heroics which saw them stun the Crues in March. The Seaview outfit’s relentless title charge was temporarily thwarted as Carrick blazed to a 3-0 half-time lead thanks to goals from Daniel Kelly, Adam Salley and Aaron Harmon. The Crues pulled two back through Michael Carvill and Paul Heatley but Carrick netted a fourth when sub Ben Roy raced through to slot home. An Aaron Smyth own goal was mere consolation for the visitors. That dramatic 4-3 win will be talked about for years on the terraces at Taylor’s Avenue but after Stephen Baxter’s side’s classy 6-0 demolition job against Ballymena United at the weekend, Carrick have a real job on their hands. Frontman Jordan Owens took centre stage at Seaview with a hat-trick and his side’s display suggests it’s going to take something special to prise the Gibson Cup away from them. Former Carrick winger Paul Heatley also landed a delightful double against the Sky Blues, with Gavin Whyte completing the carnage. Glenavon's Andy Kilmartin and Carrick's Stephen McCullough during Saturday's match at Mourneview. Photo: Tony Hendron/Presseye.com. It was little wonder Crues boss Stephen Baxter was beaming with pride as he provided his reaction on his team’s blistering showing. Contrast that with Carrick’s second-half display at Mourneview Park where Gary Hamilton’s charges rattled home four without reply. 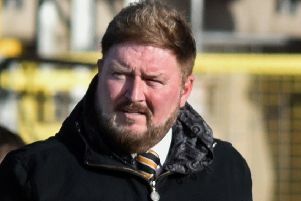 “We are disappointed to have lost by 4-0 but there really was nothing in the first half then we started to look a bit leggy in the second,” said boss Gers Kieran Harding. If you wanted evidence of exactly how the summer upheaval had affected the complexion of Rangers’ first-team squad, you need only have glanced at the team sheet. Just one player from Saturday’s starting eleven played for the club last season. Goalkeeper Brian ‘Bam’ Neeson was the only survivor from the Haveron era with new boss Harding opting to blood the new faces. Club stalwart Glenn Taggart and last season’s overhead kick hero Miguel Chines had to make do with a place on the bench. Admittedly, Carrick were facing a very strong and talented Lurgan Blues outfit but the sheer volume of new faces at the club suggests it may take a while for the team to gel. With Wednesday’s clash against Crusaders and a trip to Glentoran on this week’s agenda, the new boss will be hoping his men find some cohesion - and fast.